Introducing the Glide-Gripper. Designed for the seasoned Glide user, it’s CNC machined from billet aluminum, anodized, etched, and weighs in at about 1 pound. Drop in a tub, tighten the set screw, and you’ll never tip a tub over again. The 4 holes in the top store your Super-cheap Brush, and 3 punches, typically used for disassembly. 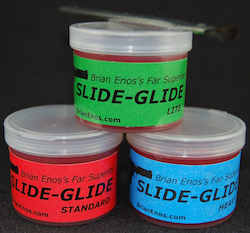 Thanks to Scott Springer for the idea, design, and creation of this nice addition to the Slide-Glide line.